There are many ways of cooking prawns and it can be boiled, steamed, grilled, baked or deep fried. I love prawns and this is one of my most favorite seafood. 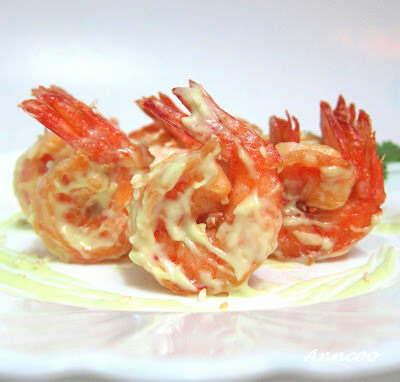 Today I made this quick and easy Wasabi Prawns and this can be served less than 20 minutes. Enjoy! Remove the prawns head and legs, leave the tails shell intact. With a small knife make a small slit down the centre of the curved back of the prawns. Remove the black vein, rinse the prawns and dry gently with kitchen paper. Add some salt and pepper and dust prawns with some corn flour before deep frying. Deep fry prawns until just cooked. Toss the deep fried prawns with wasabi mixture. Sprinkle some white sesame on wasabi prawns and serve immediately. Judy: Thank you very much for your compliment. Hahaa Katy, you'll love this after trying it. If you don't like wasabi, just mix with mayo. Pei Lin: Hope to see your post soon! Thas: Try it with mayo alone, taste yummy too. Am I reading it right, wasabi?? One thing I still don't dare to eat is wasabi. This sure will give you the kick for few days 🙂 Nice presentation. Hello! These shrimps look yummy! Actually, my brothers love deep-fried shrimps … anything deep-fried in fact … Bad on us, huh!? I'm so gonna try this! Thanks a lot for sharing! Heh! These look absolutely irresistible! Anncoo, I think people would be rushing like someone said "GO" at the races! Laura: Thank you very much for your compliment. Wiffy: Thanks! Next time I'll follow your recipe. Cheah: Try this, you'll love it. Neyeeloh: Thanks for your nice words. CBL: Thank you for coming again. I like this very much. Your photos are awesome. Mmm… looks so delicious, have now acquired and slowly enjoy the taste of wasabi! Not too much though. This is a great combo… I love wasabi sooo much and fried prawns and mayo… that is one great combination… easy to make too. thanks for the great recipe and love the pics!! Marvelous recipe! And I love your photos…they make you want to run right out and make these for dinner! Shrimp is on our menu a lot and the wasabi element would be a great way to kick up the flavor! Also am loving your strawberry ice cream roll…what a great start to summer, which is coming soon, I hope! MIAM!!! Love the shots! Make me hungry. Elin: I'm sure you have many good recipes to share from your recipe books. Little Inbox: hehee…actually is less than 15 mins. My kid also love prawn, will cook this for them, but need to reduce the amount of wasabi. Thanks for sharing. I love prawns too! I would love to try this wasabi prawn! So hungry now! Simple to make and yet yumm! In less than 20 minutes? Wow, great! Never tried making them at home before but quite a common order when our family heads to a restaurant for a celebration meal or something. They look very very yummy, perfect dish for appetizer. Wasabi is my favourite! haha I have this recipe in one of my recipe book but have yet to try it out and you beat me to it :)) Delectable yum yum ! your wasabi prawn calling my name!! hahaha! look so scrumptious delish!! Ann, these naked babes are simply seducing! I wanted to swallow them right away! hahaha…. What a scrumptious shrimp dish! Love the idea of wasabi with shrimp! I'm a prawn lover and 'spice' gal so this sounds amazing! Hahaa…Mary, Sorrry.. what to do, both of us love prawns. Xiao Yen: You'll definitely love this after trying it. Coleen: I really hope you can try this. The prawns or shrimps here are not expensive, that's why I like to buy prawns very often. Joumana: Hope you'll like this after trying it. Lia: Oh..so you're allergic to prawns..must be careful when eating this. Looking at your delicious wasabi prawns dish is really torturing me. I have an allergic for prawns … but sometimes if I really want it, I will eat it for small amount with my anti-allergic pill ready hehehe 😉 Nice close up pictures Ann! Cool … these prawns look so fresh and delicious. 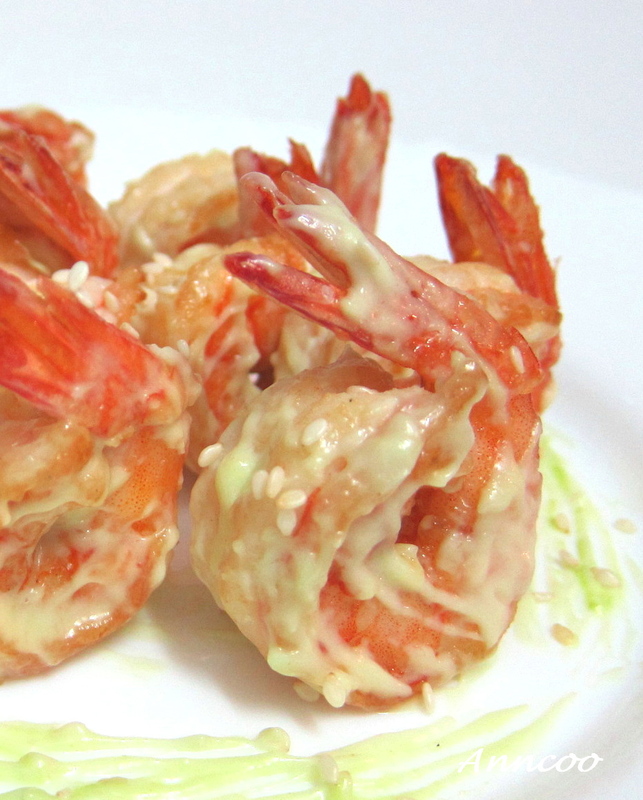 You know I am in love with wasabi but I never until now thought of combining prawns and wasabi! Thanks for a wonderful idea! 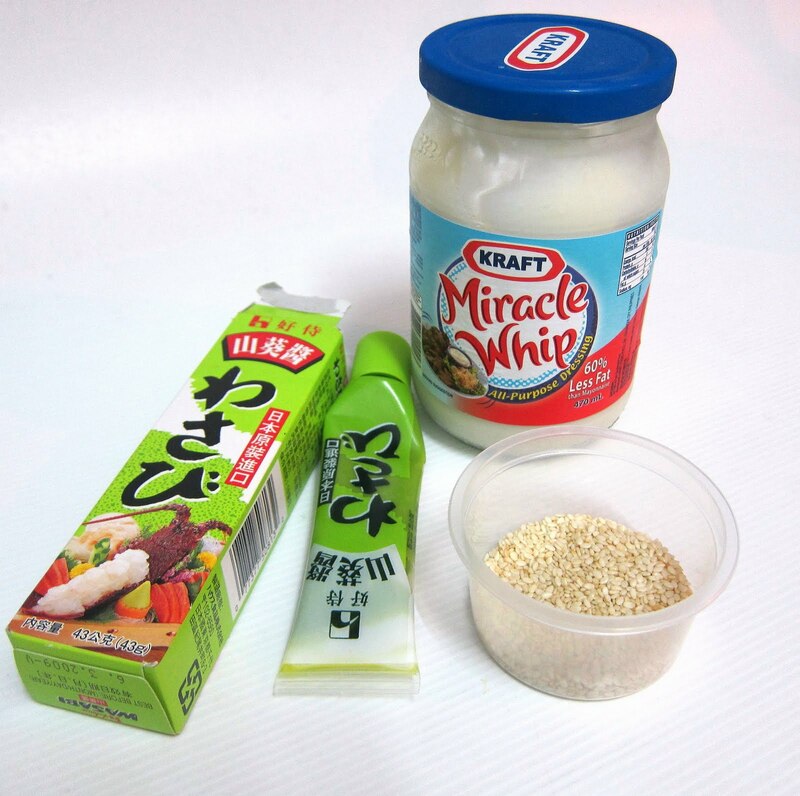 Wow, prawns that include Miracle Whip is awesome. Love your recipe! There is something about wasabi and seafood that go so well together! This looks delicious. Prawns are very expensive here, so I think I will try this with shrimp. Thank you for the recipe. That looks so beautiful and tasty!! !Great appetizer! Very nice prawn dish! great click..
Definitely will try this recipe out! I normally stir-fry my shrimps using fish sauce as the key ingredient but this is something new and so easy to make. Have a great weekend! Hullo Happy Sunshine pal, its GOrgeously spring ,blue skies and summer hues, we are so happy and with this happiness lets JOin the Party ,for dear CHaya 's BIRTHDAY. [10th april]..yeah its a suprise party for her….and she's ur pal too…. and all u need to do is hop at the link below and leave her a birthday message and link any or all of ur deliciousness u wanna bring to the party…..looking foward to u ….at the party and CHaya …is going to love having u over ……. ANd if possible please send this message atleast to 5 of ur bloggin buddys , we so wanna make her day dont we…. come to the party ….ur presence n love will make the difference…..
My favourite….PRAWNS!!! How to look at these and not feel tortured to the bones…hmmm. Anncoo, I think I'll dream of these big prawns tonight 😀 They look utterly delicious. I love the creamy look. Thanks for sharing….so simple and easy to make.